The Witches (1990) - This example was particularly striking for me. The film adaptation of Roald Dahl's book features a boy being turned into a mouse by witches. Said mouse can be seen in the film riding around on a genuine, bona fide, electrified monorail (6990) with some Blacktron I parts thrown in. For a space-nut like me, this was a real joy to see. Elf (2003) - In a scene where Buddy the Elf (Will Ferrell) is mistaken for a Gimbels employee, he takes it upon himself to decorate the "North Pole" section of the store in anticipation of the arrival of what he assumes is the real Santa. He dumps out what appears to be a 1000 piece tub of LEGO elements and proceeds to make a very large rendition of the NY City skyline in the store. Honey, I Shrunk the Kids (1989) - In a scene where the shrunken kids are unable to make it from the curb of their street, through their backyard, and back to their house, they take refuge in what appears to be a blue 2x3 or 2x4 (I'd have to watch it again to be sure which) LEGO brick that has been lost in the grass. On another note, I've also seen LEGO in TV commercials for other products. Recently, there has been a commercial for Life cereal featuring LEGO bricks. An unwitting Dad poors himself a bowl of Life cereal only to find that his son has replaced the cereal with LEGO bricks. There must be some kind of promotion going on or something, because they were actually flashing the LEGO trademark at the bottom of the screen towards the end of the 30 second spot. Sci-Fi ran a SeaQuest DSV marathon yesterday - they had one episode where they found several kids trapped in a habitat after 3 years. Legos abounded in the initial scenes with the kids. Life cereal and Quaker oatmeal were both doing Lego promotions on their boxes recently. 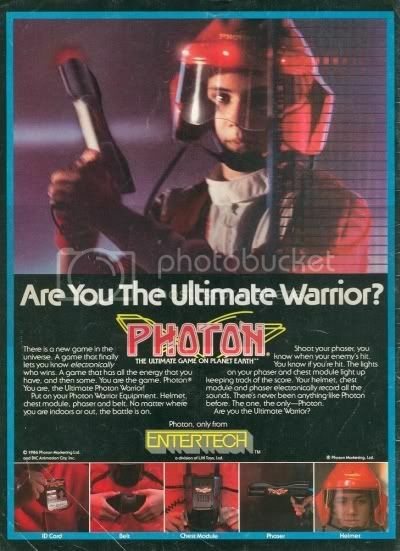 Big (1988) - In the scene where magically grown-up Josh Baskin is in FAO Schwarz stalking the toy aisles for his Photon (AKA laser tag) foe, at one point, he takes cover behind a giant LEGO display in a glass case (complete with 6657 Fire Patrol Copter in motorized "flying" stance). 6697 Rescue-I Helicopter can be seen on the roof of one of the LEGO buildings with its rotors spinning. 6385 Fire House-I and 6377 Delivery Center are also visible. All of these sets appear to have been released in 1985. In addition, you can spot 6378 Service Station, 6658 Bulldozer, 6634 Stock Car, 6677 Motocross Racing and 6698 RV with Speedboat, all from the 1986 Town line. Boxed Duplo sets can be seen in the background. Terminator: Sarah Connor Chronicles has featured Lego at least two episodes this season, in 3 different scenes. In one, John Connor's new friend Riley(?) builds him a crude robotic lego sculpture. This past week's episode had a little girl making something out of a jumble of basic brick. In a later scene in the same episode, in what appears to be an attempt to impress the little girl, Catherine (the T-1001) posing as the little girl's mother adds bricks to a very large Lego sculpture, which as a bit of behind-the scenes trivia was built by two AFOLs here in Los Angeles. A Canadian TV show called "Corner Gas" had an episode where Hank built big diorama of the town they lived in out of Legos. No one seems to have brought up one episode of Stargate SG-1where a crystal replica of Colonel O'neil visits his former wifes house, and in his dead sons room, theres the old lego shuttle with launch pad. Camelot, Camelot, Camelot! It's only a model. SHHHHH!!! I get so excited every time I see LEGO in that show. The fact that there's LEGO in it just makes me love the show even more than I did already. And nothing is cooler than a Terminator playing with LEGO. My not-at-all serious prediction: LEGO Mindstorms becomes Skynet. Not to mention during the ride home, Bart comments on his new "Lego" shirt, but is quickly corrected by Marge that he should be saying "Block" shirt. During the latest Terminator Sarah Connor episode, the 'Daughter' of the Red-head morphing Terminator is seen playing with Lego, and the Red head, in order to make her daughter happy, makes a huge skyscraper out of Lego. I thought that someone might have already posted that. Built by two AFOL's in LA, eh? Interesting - thanks for posting that. In the TV show Yes Dear, which was back around 05, they have a whole episode that takes place in Legoland, or atleast half the episode, when the family takes a weekend vacation there. I thought it was pretty cool to see a TV show do that. I think I've seen that one...part of it anyway. That reminds me, LEGOLand got a name drop in the movie Knocked Up (2007), though you don't get to actually see the place. The White Stripes' video of their song 'Fell in Love with a Girl' is a stop motion film. I'm sure most have seen it. I always wished they'd do a scene where O'Neill was playing with a Lego set and Carter or General Hammond catches him having a good old time. Perhaps it could have worked in the season 4 episode "Window of Opportunity" when time keeps looping but only Jack and Teal'c are aware. Funny to see this thread. Last night I was flipping through the channels on TV and there was a movie called The Wizard. It showed a kid playing with DUPLO bricks. I didn't watch much more; when the bricks were gone-so was I. Be glad you didn't, the movie's terrible. Basically all it is is Nintendo's gimmick in the 80's to promote the NES, Power Glove, Rad Racer, Ninja Gaiden, and SMB 3. There was an episode of the George Lopez show where Lou Diamond Phillips played George's brother and wore a Lego shirt with a giant minifig during the whole show. I remember In a Jackie Chan Film (i cant remember which, it was the one were some Japanese/Chinese teens were killing police and making computer games based on how they killed them), one of the final fight scenes was set in what appeared to be some kind of Lego convention, where Jackie and bad guy proceeded to destroy huge Lego statues and throw each other into the boxes, it was awesome, dunno if that helps. Edit: found the film, its called "New Police Story" or "Xin jing cha gu shi"
Oh yes Zombifox, you're referring to New Police Story, my favourite film in which Lego features. One of the fight scenes takes place in a Lego store. Jackie Chan uses elements such as duplo tubs, Lego displays and even brick-like protrusions on the wall in the fight.